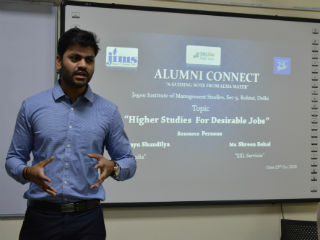 IT Department of Jagan Institute of Management Studies organizes “ALUMNI CONNECT”, a series of Guest lectures with JIMS Elite. Another session on this series was organized for BCA students [2017-2020 batch] on 13th October 2018 in Room no: 305, Building C, JIMS Rohini, Sector-5. 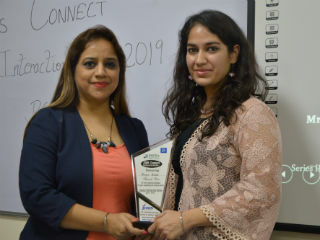 ALUMNI CONNECT is a significant platform that gives an opportunity to the current students to have an interaction with their seniors and get the glimpse of the latest trends & technologies being used in the industry. 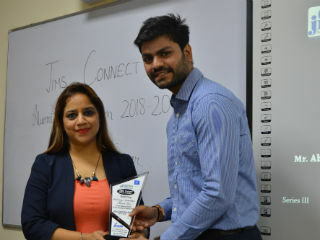 Mr.Abhimanyu Shandliya (BCA 2013-2015), currently working as “Consultant” in “EY India” and Ms.Shreen Behal (BCA 2012-2014) currently working as “Quality Manager” in “EXL Services” were eminent speakers for this session. 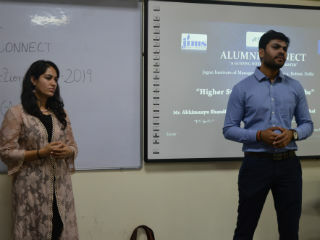 Their topic “Higher Studies For Desirable Jobs” was appropriate for BCA II year students, as they to make a choice between higher studies and placements. Session was inaugurated with floral welcome of Alumni’s followed by welcome address by Dr. Parminder Bajaj. 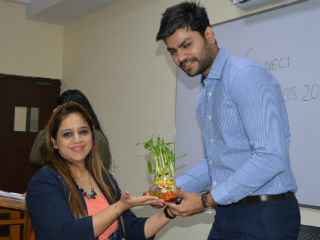 Initial one hour session was taken by Mr. Abhimanyu and topics like Role of creativity & innovation in achieving desired positions, importance of Communication skills in job were taken up. The later hour of the session was conducted by Ms. Shreen and she concentrated more on need of higher studies to achieve higher designation. 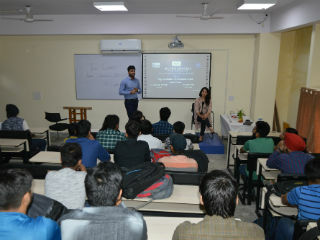 It was an interactive session concluded with lot of inquisitive questions from students to their seniors.